Is it Cheaper to Reupholster or Buy New? For most individuals, price is the most important factor when deciding whether to reupholster or replace furniture. Reupholstery costs vary greatly from piece to piece and depend on factors like the size of the furniture and chosen fabric. Fabric remains the greatest predictor of what your final price may be. Upholstery fabric costs can vary tremendously. When shopping for fabrics, make certain you are aware of the quality and warranty before purchasing. We see all to often people who purchase fabric from an outlet or big box store at a cheap price, find out later the fabric did not last on their newly recovered furniture. Most of today's top brand furniture has adopted less expensive materials and manufacturing techniques. If you have a sofa manufactured more than 10 years ago chances are the materials and construction are far better than the same one of today. When building high-quality furniture, manufacturers use Oak and other hardwoods for the frame and attach the joints using dowels and glue or screws. Inexpensive furniture usually has staples holding together the joints. So the structural quality is well worth the consideration when making a decision to have reupholstering done. Of course we do. An advantage of reupholstering furniture is the chance to repair frame once the piece is torn down. We can examine the frame and repair or replace damaged sections at your request. Most repairs can be estimated without removing any upholstery. But there are times damage can't be determined until the upholstery is removed or partially removed. We also can reinforce the frame and joints, replace springs and webbing as required. Often the repairs made are better than when the piece was new. Please Note; We do not repair electrical / mechanical units contained in some furniture such as La-Z-Boy and others. Please contact the manufacture of your product for repair information. There are many benefits of reupholstering and one is assuring that your priceless family heirloom is passed down through generations to come. We have the privilege of restoring many beautifully crafted antique pieces to correlate to your interior decor. Reupholstering is a frequently used to beautifully correlate colors, patterns and designs into a rooms decor. This is a perfect opportunity to have matching pillows, draperies, stools and other interior upholstery done with your chosen custom fabrics. How Much Does Pick-Up & Delivery Cost? 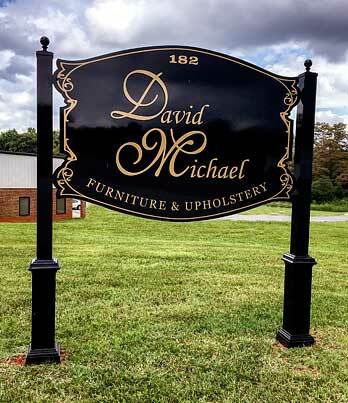 Pick-up & delivery is FREE within 15 miles of our shop located at 182 Airpark Drive, Lynchburg VA 24502. If you are outside of this range it may be possible we have a truck already scheduled for your area, please contact us for more information about pick-ups and deliveries. Yes, we do. Refinishing most always requires the upholstery to be removed and we can handle the entire process from start to finish. Reupholstering is a perfect time to decide if you want wooden features of your furniture refinished. We can touch up and repair finishes locally in our shop or for complete wood refinishing, we work with a professional company located in North Carolina. Your furniture is torn down and prepared here locally and then sent out to the finishing shop. Once your newly refinished furniture returns to our shop, your new upholstery is then applied. If you are interested in complete refinishing, you may contact us and we will give you all the details and information.